I’ve been interested to note in the last few weeks a couple of ideas which may appear to be more closely related than we might think. I think that is an interesting argument, and an important point to make as funding for a lot of projects is tight right now, but particulary art and cultural projects. Without government funding, or other revenue sources, these institutions may be pricing out younger and lower-income visitors. Now, they may have access to culture at some other location, a concert, via the web, or in another way, but long-term this would seem to harm the museums standing among these groups. Secondly, I wonder how this trend of admissions increases might impact arguments for universal museums. David Gill has been poking holes in many of the ideas in the collection of essays edited by James Cuno “Whose Culture?”. Cuno of course is one of the more outspoken proponents of the acquisition of objects even where they may have been looted or illegally removed from their context. And scholars on both sides go around and around on that argument, and tend to devolve into their entrenched positions with no real progress being made for cultural policy generally. But one argument I don’t see made is whether these Universal Museums may not even be Universal for the inhabitants of the city they are in. Are these rate hikes espousing Cosmopolitan values? If so, don’t we need to apply them equally, whether that applies to the acquisition of a piece lacking history, or to how many and what types of people can come and view these objects? I think it does. Philadelphia Mayor John Street announced yesterday that the $68 million needed to keep the Gross Clinic in the city has been raised. 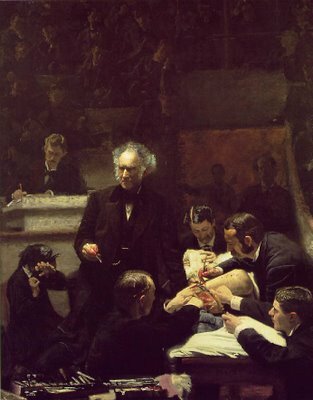 The Philadelphia Museum of Art and the Pennsylvania Academy of the Fine Arts will share ownership of Thomas Eakins’ 1875 depiction of a surgical procedure. Exactly how much money was raised, and how much the 2 art institutions have had to borrow to match the purchase price remains to be seen. It’s been estimated that about $30 million has been donated in the six weeks since Thomas Jefferson University announced it would sell the work to the new Crystal Bridges Museum, and the National Gallery if the purchase price was not matched locally. The decision to sell the painting was met by a great deal of local protest, but it seems all the parties involved, with the exception the original purchasers, have come out looking good. The University gets its funds, the work has received a great deal of publicity and should be visited a great deal in the coming months, and Philadelphia has kept one of its prized local works. However, some have pointed out that the fund-raising push may limit the amount donors are willing to give to other good, non-charitable, causes. At the heart of the decision to sell the work, lies a question which often plagues cultural property. Do very beautiful works have a single home, or can they be enjoyed and appreciated anywhere? That’s a question without an easy answer. Those who donated to this effort felt strongly that this work belongs in Philadelphia. Though it would have been enjoyed and appreciated in Arkansas, Philadelphia would have lost a measure of civic pride. In any event, for the foreseeable future, the Gross Clinic will remain in Philadelphia. Philadelphia Mayor John Street has withdrawn the nomination of The Gross Clinic for designation as a historic object. It seems the only way the work can remain in Philadelphia is for the matching process to take over. It’s not clear where the fund raising efforts are at now, but Lee Rosenbaum reports that they are more than halfway there based on her interview with the major gifts officer of the Philadelphia Museum. The work, recognized as one of the greatest American paintings, has been sold for $68 million to the new Crystal Bridges museum in Bentonville Arkansas (a scale model is pictured here), which will share the work with the National Gallery. Trustees of Thomas Jefferson University voluntarily agreed to delay the sale so Philadelphians could come up with funds to keep the work in Philadelphia. I am not terribly surprised that Mayor Street has declined to continue the Historic Designation procedure, as it amounts to a municipal export restriction. Many nations have export restrictions which prevent the export of works, but the US is the main exception. With the lone exception of some Native American artifacts covered under NAGPRA, generally, any work of art can be freely exported from the US. This is not the first time Philadelphia has acted to prevent the removal of a work of art. Donn Zaretsky pointed out to me that Philadelphia used the historic designation process to keep The Dream Garden in the city in 1998. Efforts to prevent or delay the sale provide an interesting new way to think about export restrictions. Export restrictions are a reality for the art and antiquities market, but they are quite controversial. They generally involve underdeveloped source nations (such as Peru, Guatemala, or Nigeria) and wealthy market nations (like Japan, the US, or the UK). At issue in the source nation debate are inherent concerns about the less developed world, cultural appropriation, and the continued exploitation of the underdeveloped world. If Philadelphia had continued to prevent the sale, it would have sharply cut against the prevailing position of the US, which generally frowns on export restrictions. From an intellectual standpoint, I’m disappointed the historic designation process has been abruptly halted. The Eakins debate strips away those concerns, as Philadelphia is on roughly the same footing as Bentonville. This allows us to focus in on the core issue, which asks, do certain works belong in a certain context? Might context be secondary to the interests of the University, which plans to use the funds to expand its campus. Also, might there be a greater value in allowing more of the public to view the work? It’s not clear why exactly the mayor chose this moment to halt the process. Perhaps he did not want the process to get dragged through a lengthy court battle, or perhaps he wants the civic fund raising efforts to receive priority. One potential solution which has not been explored is for Philadelphia to buy a share of the work, which would let it display the work periodically. This would allow people to see the work in Philadelphia from time to time, while allowing a greater audience for the work. Some have estimated that as few as 500 people saw the work last year. The main disadvantage would be the risks inherent in transporting valuable works of art, however, the work will already be traveling anyway, between Arkansas and the National Gallery. Morning edition today features a story on Thomas Eakins’ “The Gross Clinic” and attempts by Philadelphia to prevent it from leaving the city. Trustees of Thomas Jefferson University have given the city and benefactors until December 26th to raise enough funds to keep the work in the city. The City has also chosen to invoke its Historic Preservation law to prevent the work from leaving the City. This is a fascinating example of a city choosing to exercise an export restriction, which normally only takes place at the national level. I have written a number of posts on the proposed sale of Thomas Eakins’ “The Gross Clinic” in recent weeks, but the dispute is a fascinating one, because it cuts to the heart of the importance of the connection between art and its location. Do works of art or antiquities inherently belong in a given location? Eakins, pictured here, is recognized as one of America’s greatest artists. He was known for bringing a stark realism to his work, which could often be unflattering to his subjects. The work has been sold for $68 million to heirs to the Wal-Mart fortune for the new Crystal Bridges museum in Bentonville, Arkansas. Trustees of Thomas Jefferson University voluntarily agreed to delay the sale so community leaders in Philadelphia could come up with the funds to keep the work in the city. This is a voluntary version of the UK’s export restriction, which allow the UK government time to raise funds to keep a work at home before it is exported. Some have argued that as few as 500 visitors saw the work in Philadelphia last year. I wonder if debate surrounding the sale would be quite so adamant if the work was being sold to the Met, or the MFA in Boston, rather than what some may see as a new “Wal-Mart Museum”. Efforts to prevent or delay the sale provides an interesting new way to think about export restrictions. Many nations use export restrictions to prevent the loss of important cultural works. The US is one of the few nations without such restrictions. Philadelphia’s mayor has nominated the work for historic status, which would effectively act as an export restriction at the municipal level. Export restrictions are a reality for the art and antiquities market, but they are quite controversial. They generally involve underdeveloped source nations (such as Peru, Guatemala, or Nigeria) and wealthy market nations (like Japan, the US, or the UK). At issue in the source nation debate are inherent concerns about the less developed world, cultural appropriation, and the continued exploitation of the underdeveloped world. If Philadelphia continues to prevent the sale, it would countervene the prevailing position of the US, which generally frowns on export restrictions. The Eakins debate strips away those concerns, as Philadelphia is on roughly the same footing as Bentonville. This allows us to focus in on the core issue, which asks, do certain works belong in a certain context? Might context be secondary to the interests of the University, which plans to use the funds to expand its campus. Also, might there be a greater value in allowing more of the public to view the work? I think so, but one thing remains clear, I’m sure the painting has earned far more visitors in recent weeks because of the controversy. Thomas Eakins’ “The Gross Clinic” has been nominated for protected status by Philadelphia’s mayor. This may effectively mean the work will not be sold later this month as proposed. I’ve written about the proposed sale before here. Donn Zaretsky has posted a number of interesting developments as well. Stephan Salisbury of the Philadelphia Enquirer reported yesterday that Philadelphia’s mayor has designated the work as a historic object, which would prevent the work from being sold, as proposed by the trustees of Thomas Jefferson University. The University had agreed to sell the work for $68 million to a new museum in Arkansas funded by heirs to the Wal-Mart fortune. The University voluntarily gave local institutions until December 26th to match the price and keep the work in Philadelphia. However, the city has stepped in to prevent removal. This is an interesting turn of events, and is the only example I’m aware of a city preventing the export of a work of art. Many nations attempt to prevent the export of works of art, but I am aware of no individual cities preventing the removal of an important work. The US is among the few nations in the world which has no export restrictions on works, due in part to its status as the largest art importer in the World. It’s quite interesting to see an individual city make make similar claims to that of source nations such as Peru, Mexico or Egypt. The potential litigation in this case should be very interesting to watch unfold, if the trustees are unable to reach a satisfactory resolution with the city. Donn Zaretsky points out that this is not the first time Philadelphia has used historic designation to keep a work in the city: In 1998, “[in] the case of Dream Garden, a collaboration of Maxfield Parrish and Louis C. Tiffany whose sale ignited considerable public controversy, the Historical Commission acted after receiving a nomination request from then-Mayor Ed Rendell.” The Commonwealth Court’s decision on the case is available here.